Reviews of Kathryn’s critically acclaimed performance in the role of Zerlina in Opera North’s production of Mozart’s Don Giovanni March – April 2018. Directed by Alessandro Talevi and Conducted by Christoph Alstaedt and Matthew Kofi-Waldren. “Kathryn Rudge shines as Zerlina – comically brilliant and flawless vocally…” Upstaged Manchester, The Lowry. “Mezzo Kathryn Rudge’s Zerlina was splendid and sprightly, endowed with a forcefully-conveyed, naïve sexiness as the peasant bride.” Bachtrack, Grand Theatre Leeds. “The delicious creamy-toned Zerlina of Kathryn Rudge” Oxford Mail, Grand Theatre Leeds. 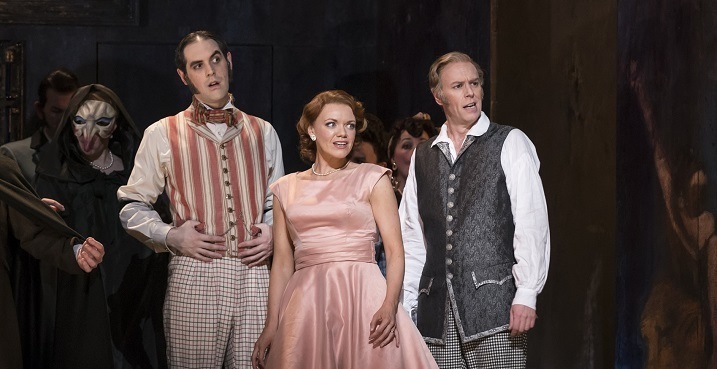 “As the flirtatious Zerlina, Kathryn Rudge is delicious” Opening Night Reviews, The Lowry. “The Zerlina of Kathryn Rudge was almost a show-stealer” Manchester Evening News, The Lowry.